Occasionally I will Google family names, just to see if any new information has come to light out there on the internet. Sometimes this is fruitless, but sometimes it produces a gem of information. I found an article relating to my 2x great grandmother Jule Dzerve’s little brother Fricis, a student at the Kuldiga teacher’s seminary and active participant in the growing revolutionary movement in the Russian Empire in 1905 and the farm owned by Jule and her husband Indrikis Ziverts – Skrundenieki. This article was generously translated for me by a member of the Latvian Genealogy community. It is important to note that this article was published in the 1980’s in Kuldiga, Latvia during Soviet times, and as such, is written from a Soviet viewpoint. “75 years ago the revolutionary movement was active around Nikrace. In 1905 Fricis Dzerve, who lived at Skrundenieki, joined the LSDSP (Latvian Farmer’s Union – political party). He participated in the farm workers’ strike and was an organizer in the revolutionary violence in Aizpute and other revolutionary events. Party members from Liepaja visited Skrundenieki often. Through Fricis Dzerve, Nikrace revolutionaries as well as others in Latvia and Russia learned about the events in Liepaja. At the end of 1905, due to the arrival of Kurmales Baron Silvio Bredrihs led forces in Nikrace, Fricis Dzerve hid in the forests around Nikrace. On 12 Jan 1906 S. Bredrihs’ forces broke into Skrundenieki, upon not finding the Fricis, the brave revolutionary, they burnt down the house. In March, they finally found Fricis, he was imprisoned and tortured but did not betray anything or anyone. He had told his sister that he wouldn’t be either the first or last to die at the hands of the counter revolutionaries. He was shot at Priekule. The ‘forces of punishment’ also dealt inhumanely with other revolutionaries. At Skerveli, servants Julijus Dikerts and Jekabs Pauna were imprisoned in Mazdzeldes sawmill. To liven things up the Czars forces took their prisoners to the forest and demanded that they recover whatever they had hidden. Of course there was nothing to recover. Having belittled and laughed at the revolutionaries the Dragoons took them to Dizdzelda house. Turning in the opposite direction they stopped and shots rang out. Jekabs Pauna slumped dead onto the snow. Julijus Dikerts was seriously injured. Another shot rang out. But the drunken Dragoons still had not accomplished their objective. A Dragoon who was not as drunk as the rest, rushed over and bayonetted the revolutionary. The inhabitants of Nikrace were subjected to a bloodbath, the Dragoons acted insanely. They attacked the Manor house’s coachman Jekabs Grinerts and accused him of plotting to burn down the Manor. For having these thoughts he deserved the highest sentence without any further investigation. The threat was immediately carried out, he was shot along with Nikrace manor’s servant Oto Stepanski and Ernests Nunevics. Janis Versinskis, servant from Dizdzeldas Manor was murdered at Kaku grava (literally cat’s ravine). Jekabs Rosentals LSDSP member and committee member of Brinki government was also shot. Ernests Iesalnieks, servant from Brinki and Ievalds Rozis, servant from Mazdzelde were murdered at Tukums Manor. A passerby saw that Ernests Iesalnieks showed signs of life and reported this to the Manor. Without hesitation a group of Dragoons immediately returned to the murder scene and bayonetted the revolutionary. If you’ve found this blog, chances are that you’ve got some interest in your own family tree. I realized that I’ve never written about some of the best resources I’ve ever come across. These three Facebook Groups are filled with some of the friendliest, most knowledgeable people who are all researching their own trees and are willing to help others too. Join us! Good news! 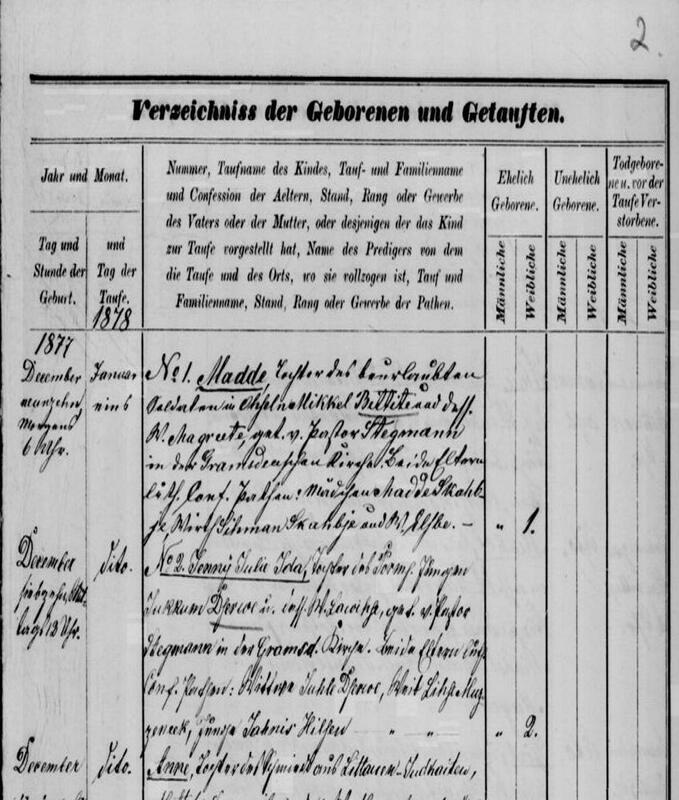 Www.FamilySearch.org now offers some digitized records pertaining to Latvian genealogy! While they have always offered a decent collection of Latvian records via microfilm, they now have some passports from the interwar period and some old church books digitized and available for viewing from the comfort of home. The church books are the same as are featured at lvva-raduraksti.lv – except the collection at FamilySearch.com was originally compiled at a different time period than that of the Latvian State Historical Archives. This has produced some minor differences in the two collections – which might just translate to genealogy gold for you, if you can find a record that was previously missing. For example, my Akerfelds family’s “home church” of Embute is missing records from 1855-1870. I noticed that FamilySearch’s collection states that it covers this time period. A few years ago I ordered this microfilm in, and indeed, there are the years missing from Raduraksti. To my dismay, in this case only the German congregation records had been recorded during those missing years. Another example is in Nurmuiza parish – on Raduraksti, the only records from 1834 and further back in time are for Germans. At FamilySearch, you can go back to 1711 for Latvians as well. Nothing is indexed yet, so the passports are especially difficult to utilize in a quick manner. But don’t forget to check in periodically with FamilySearch.org to see what else has been digitized! Born December 29, 1877 and baptized January 6 1878, No.2: Dzenija Jule Ida, daughter of Purmsati estate jungen Jukums Dzerve and his wife Lavize. Baptized by pastor Stegmann at Gramzdas church. Witnesses: widow Jule Dzerve, maiden Lize Muceniece, and jungen Janis Hilsen. Jule Dzerve was my 2x great grandmother. Her parents were Jukums Dzerve and Lawise Bittner, who were married in Gramzdas draudze that same year. They lived at Purmsati estate, one that had a German baron who was particularily disliked by his peasants, wo complained that he taxed them too harshly. Surnames amongst the peasants were only used loosely even into the 1850’s. 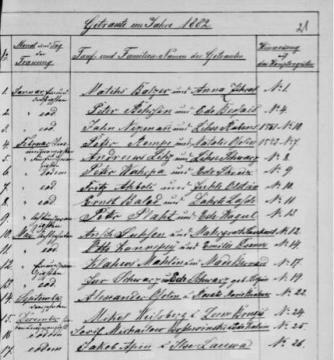 There is a small gap in records at Grazmda from 1854-1861, and this is the time I believe both Jukums and Lavize were born, so unfortauntely I have not found their parents names yet. Dzerve is a name associated with Purmsati estate since the beginning of surnames, while Bitners I believe has roots at nearby Gavieze estate. Mada is my great-great-great-grandmother, her daughter Ieva Sedols married Jekabs Akerfelds. Just as her marriage record to Janis Sedols states, she was born at Gobzemji farm in Vecpils estate. 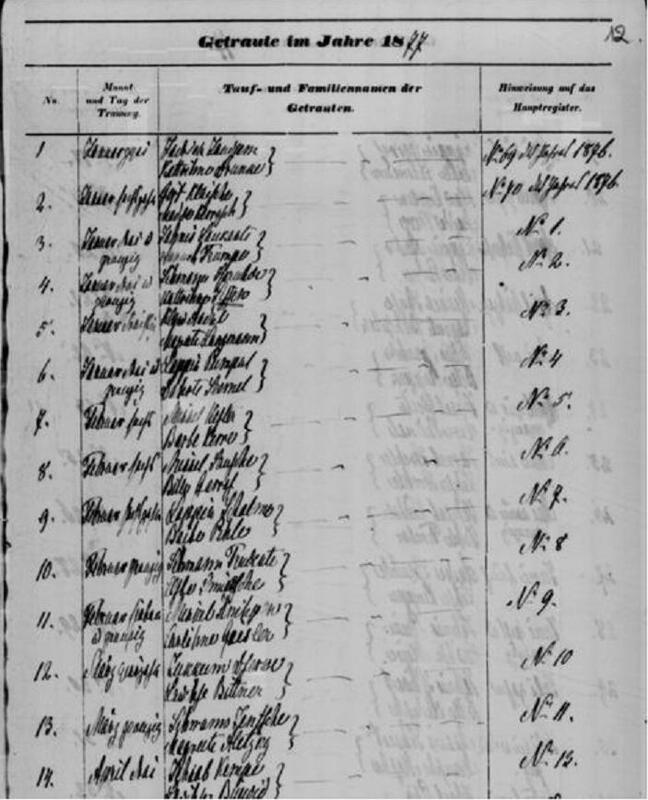 The revision lists were basically lists of inhabitants of estates for tax purposes, almost like a census (the first of which for Latvia came later, in 1897). Usually on an estate, there were anywhere from 5ish to 40+farms, which would be numbered. The inhabitants of each farm were recorded in 1857/1858, 1850, 1835, 1816 and 1811. Not all years have survived for all estates, but the 1857/1858 (10th revision) seems pretty constant between all the estates that I am dealing with, so this is the one I will refer to most for now. 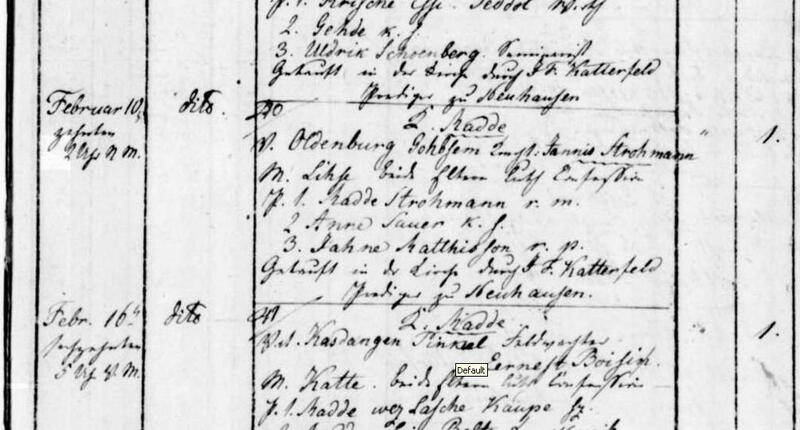 I’ll do my best to transcribe: “hinzugekommen” means “added”, so these people listed above were coming to Berghof (Kalnamuiza) from other estates. “Wo nach der ordnung der revision list vom jahre 1858 gegenwartig hinzugekommen” = “Where, according to the arrangement of the revision-list from years 1858 presently added” Basically, what farm within the estate are these people now living at. “Tauf, Vater, und Familien-Namen” = “Baptismal, Father’s and Family Name”. The small 4 columns on the right pertain to age. Alright, so my Janis is at the top of this list. In 1865, he began living at Kalna farm, which in the 1857/1858 revision was designated farm #10. His family number is 13 – families were also given designated numbers in the 1858/1857 revision – there were no Sedols living at Kalnamuiza estate then, but the family number of 13 was given to the “Jansons” family. Whether or not this means Janis was related to the Jansons (there were a ton of Jansons in the area) I have not decided yet. 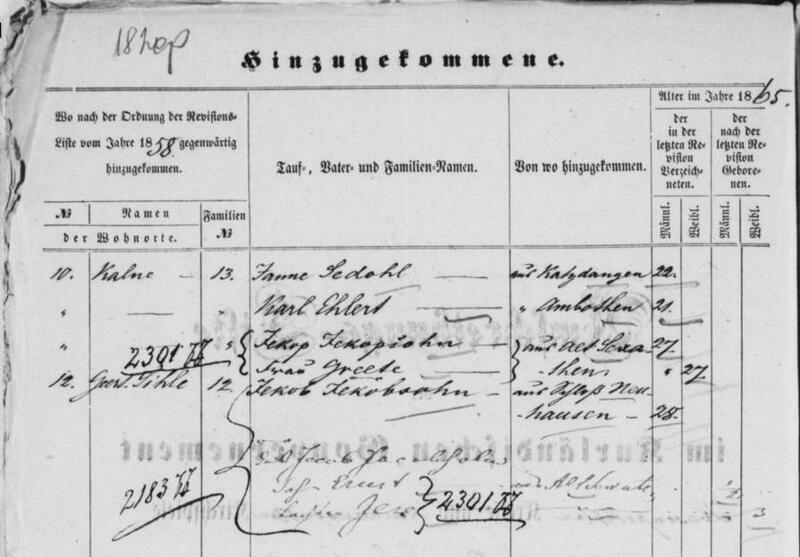 His baptismal and family name are included, but unfortunately they omitted his father’s name (which I believe to be Kristaps anyway, from his marriage record). He came from Kazdangas estate, north and west of Kalnamuiza and is aged 22 years. His marriage record to Madde Strohmann is found in the Valtaiki Lutheran parish book in the same year – 1865, and their first child, my great-great grandmother Ieva (as well as her brother Janis in 1871) was born in 1869 at Kalnamuiza estate, Jaunzemji farm. Ideally I would be able to go to the Kazdangas estate revision lists now with this knowledge, and look for Janis, but the books are mostly missing from this estate. Knowing that he was 22 in 1865 means that I can go back through the Valtaiki Lutheran church books and search for his baptism in 1843ish. Mikelis Veisbergs (Weissberg) and Line Brugis (Brugge) were married in 1882 at Rezekne Lutheran church. Since they were married in December 1882, it could be assumed that at that time they were in their early 20’s, so they were probably born around 1860-1865. Veisbergs is latvianized from German “Weissberg” – White hills or mountains. I have scanned all available Rezekne Lutheran church books and not found another Weissberg. Brugis however, are plentiful, suggesting that they were probably well-established in the area. I was stumped on this family for a long time, until a clue from a DNA match led me to the true origin of the Brugis family, to the north in Gulbene parish.